New Directions Education Proud Sponsors of the Annual Birmingham City University Job Fayre. 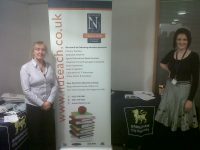 New Directions Education attended the Birmingham City University fayre last week. Senior account manager Stephanie Bellett who attended and spoke to the assembly of students said “We are very supportive of Newly Qualified Teachers and understanding their struggles in finding suitable work within Education.” With the long-standing relationships New Directions has with both Primary & Secondary schools within the West Midlands we are pleased to say that over half of the students from the open day will be successful in finding a Teaching position. Many of the students who attended the fayre signed up and will soon be placed with schools in the West Midlands, pictured is Stephanie Bellett Senior Account Manager with Julie a Senior Education Management Lecturer for BCU.